This week we’re thrilled to introduce you to the lovely Anne Adams of Curls and Contours. Anne is a lifestyle blogger and influencer who’s found her niche writing and sharing about fashion for REAL women. She rejects the idea that being plus size means compromising style to fit what society thinks women should be wearing. Of course, Anne inspires us - but we’re most grateful to her for making us truly examine what we feel about the fashion industry. We’re glad to see major brands like Madewell and Anthropologie coming out with size-inclusive options, but WHAT TOOK SO LONG? Curls and Contours examines this question while celebrating the positive shift in the fashion industry. We interviewed Adams about her personal style, advice for budding “influencers”, and favorite pre-pregnancy drink! Genuine, informative, and passionate; we know you’ll love Anne as much as we do! Tell us a little bit about Curls and Contours! What inspired you to start your business? Curls and Contours is a fashion and lifestyle blog that is for the curvy girl that wants it all. I started Curls and Contours 4 years ago as a way to chronicle my body positive journey through fashion. I quickly realized that in todays society plus size women are specifically taught that they cant “have it all”, meaning because they are plus size or overweight they are inherently flawed and will always miss out on the best life has to offer. Its my goal to live my life and seek it “all” out, self acceptance, great relationships with my family and friends, a home that I adore, a job that fills me with passion, and a great wardrobe. Its my goal to live and share because to me every plus size woman should be the curvy girl that wants it all. Describe your personal style. Who are some of your favorite designers/brands? Personal style is so fluid. It changes from week to week and really depends on the season of life you are in. I would say my personal style is trendy with an emphasis on FIT. I love mixing high end pieces with affordable garments and will shop pretty much anywhere. I gravitate towards earth tones and that is played out across my entire life, from my home to my closet. The most stylish women you know all have one thing in common, their clothes FIT really well. They aren’t stuck on being a certain size and know that having something altered to fit right can change the whole look. Favorite designers….Thats tough too because I will shop everywhere from thrifts in LA to boutiques in small towns. Off the top of my head this minute, my favorite designers/brands are Louis Vuitton, Anthropologie, Eloquii, Universal Standard, ASOS, 11Honore, Madewell and of course Whitetail Farm :). I am more brand driven than designer driven, I like what I like so I am not married to one specific designer, I play the field. What do our readers need to know about “plus size” fashion? There is NO SHAME in being plus size and loving fashion and loving yourself. The fashion industry is going through a major shift in mindset when it comes to shapes of the human form. Plus size women have more options today than they ever have had and that is powerful. 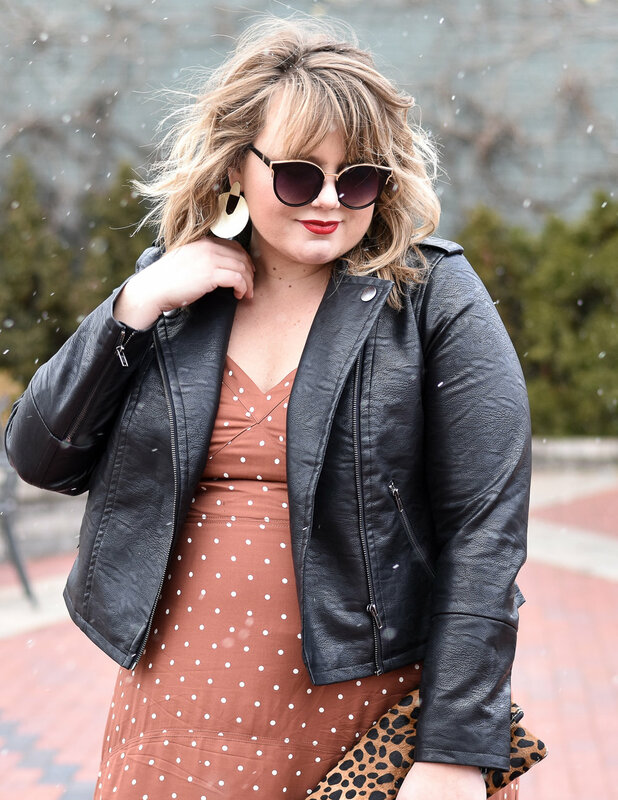 To me fashion is for everyone, and plus size people are now a part of that. What does it mean to be an "influencer"? The term “Influencer” is so funny to me. I used to be a blogger, but as technology has changed so has the nature of my job. In my opinion an influencer is anyone that inspires you to take a chance, make a change, or try something new. Social media is a tool for me to spread my message further and engage with people from all over the world, if you see me in Costco and ask about my jacket that is being an influencer, if you see me on the Gram and ask about my jacket THAT is also influencing. What does a typical day at Curls and Contours look like? Are you a work-from-home gal or do you prefer hitting your favorite coffee shop? Curls and Contours headquarters (my house) is currently undergoing a change, my office is getting ready to function as a part time playroom, part time guest room and part time office. Before my pregnancy I would get up and get down to my office and work from there for the day, since my pregnancy my entire house is my office and I work from whatever room I am most comfortable in. For most of the winter I was tucked up in my living room by the wood stove, and now I am working from my light filled sun room. I do prefer to work from home, that way I can be close to my dogs and skip makeup if I want to. I was raised in an entrepreneurial household, and from a young age I learned that in business find a way to say yes to every opportunity that comes to you. Being flexible and figuring out how to make every opportunity work for you is an agent for growth and change. You have such a unique, genuine approach to blogging. It's so fun to follow along with your life, travel, amazing style, and growing family. What is it like to share yourself with followers in this way? Is it rewarding? Can it be difficult at times? Where do you draw the line on what to share? First of all, thank you. :) Second, yes its rewarding. In my mission to have a whole and rewarding life I have rarely come across people that do not engage with me in a positive way. I follow my gut with what to share or not share and I always try to keep it professional. This past year I was going through some personal changes in my journey to get pregnant, I chose not to share that with my audience and when we did get pregnant I waited a long time to share that. I have to tell you, it was really hard keeping this big exciting life change from my readers and followers. But in the end I was able to share exactly the way that I wanted and in the process I learned a lot about my personal boundaries for my brand. You've partnered with so many great brands! What are your thoughts on brand partnerships? Who are some of your favorite companies to work with? Brand partnerships are a huge part of my job and essential for Curls and Contours. I only like to partner with brands that I really love and would buy from, having this “guiding light” has made it really easy to pursue brands that I want to share with my readers and followers. When I first started Curls and Contours I had a goal to email and pitch 3 brands per day that I loved and wanted to work with, I was quickly able to see what about a brand I loved and what I didn’t like. I still use that skill set today even though how I connect with brands has changed. My FAVORITE brands to work with are Michigan brands(from shopping centers to boutiques), and female founded brands! Working with local brands is so important to me, I love being able to share great spots in Michigan to shop, dine and enjoy with my local following. On a national level working with female founded brands is really inspiring. Jumping on a call with other women that are passionate about their creations is one of my favorite parts of my job. What are 3 things newer bloggers/influencers need to know to be successful? This is seriously SUCH A GOOD QUESTION!! 1) BE SPECIFIC have a niche, talk about things that you are really passionate about. There are a million influencers out there talking about what is in their Amazon cart, if you want to talk about that then be as specific as possible, color your narrative with WHY that works for your life and people with lives like yours. 2) YOU HAVE TO PITCH. When you are first starting your blog seek out brands that are on your level that you LOVE and reach out to them, have an idea and a timeframe of when you would like to work together. The number of followers and readers you have doesn’t diminish your ability to have influence, show that passion to the company you would like to work with and see if you can make something work! 3) LOVE on the readers and followers you currently have. Reply to every comment, answer every question, followback, like back. Lean in to the community you currently have and you will experience “growth." Name a trend that will never go out of style: Denim Jackets, go with everything and have the ability to transform any look! Name a trend you hope never comes back: Low rise pants/denim are out and need to stay that way!!! Design advice to live by: Follow your heart, if YOU love it then its perfect. Most beloved item in your closet: That changes by the day. Right NOW its my Anthropologie dresses that fit over my bump and my handbag collection. Ideal vacation: Sunny island, with a great pool OR beach OR both! Who do you love to follow on Instagram: @withwonderandwhimsy, @sisterstudioig, #hygge, @ashley_dorough, @thespoiledhome, @jvn, @lizmariegalvin. Literally there are soooo many I have to stop myself. Go-to drink order: Pre Pregnancy … Wine!! Preferably Meomi Pinot Noir, but in the summer I love a good Rosé! Best restaurant in the area: That’s a tough one, pregnancy cravings have changed me!! lol….The Garage Northville. Favorite way to spend a day off: With my family enjoying some nice weather, either at my house or at my parents ranch! If you could have brunch with anyone who would it be? Off the top of my head. My girlfriends that live across the country that I only get to see once or twice a year!